What are the special birthdays in Japan? Previous: What are the old Japanese units like shaku? Next: What are the Japanese numbers from 1 to 100? Japan has several birthdays which are considered to have special meanings. The third, fifth, and seventh birthdays are the occasions of shichi-go-san (七五三), a festival for three and seven-year-old girls and five-year-old boys. The twentieth birthday, Hatachi (二十歳), is the age when a person is considered to become an adult, and can vote and drink alcohol. The sixtieth birthday is the occasion of kanreki (還暦), when five cycles of the Chinese zodiac, the jikkan jūnishi (see What is the Jikkan jūnishi? ), have completed, and the person is said to be reborn. During kanreki, the birthday person has a party with a cake decorated with white cranes and red turtles. The white cranes are a symbol of 1,000 years, and the red turtle represents 10,000 years. A sleeveless red jacket is given to the 60 year old. This jacket is called a chanchanko and it represents a baby's jacket and a return to the beginning of life. The eighty-eighth birthday is the occasion of beiju (米寿), "rice age", because the Chinese character for rice, 米, looks like the characters for eight tens plus eight (八十八). 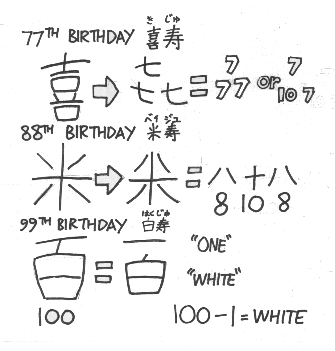 The ninety-ninth birthday is the occasion of hakuju (白寿), "white age", because the Chinese character for white, 白, looks like the Chinese character for one hundred, 百, with the top "one" removed.